Milan 09: Berlin designers Studio Aisslinger present new work in Milan this week, including the Coral lamp shown above. The seating (below) and lamps in the Coral range are made of felt and polycarbonate. They will be on show at Made in Berlin 09, alongside Studio Aisslinger's blown-glass Mesh vases (below). Meanwhile their cantilevered A-chair for L’abbate (below) will be launched at Superstudio Piu. Visit the new studio aisslinger editions - coral seating modules - coral lamps and mesh vases as a part of the Made in Berlin 09 exhibition space, via gaspare bugatti 13, 20144 Milano. You will see the tree lamp (producer: dab, Barcelona) and the gap chair (producer: Fornasarig, Italy) at the Mercedes Benz Showroom at Mercedes-Benz Milano S.p.A.,via gallarate 450, angolo via daimler, 20151 Milano. We are very pleased to launch our new chair family - A-chair - produced by L´Abbate at the L´Abbate fair booth SUPERSTUDIO PIU . Stand nr. 16 , via tortona 27, 20144 Milano. The coral suspension lamp is a lighting sculpture edition by studio aisslinger created in 2009. 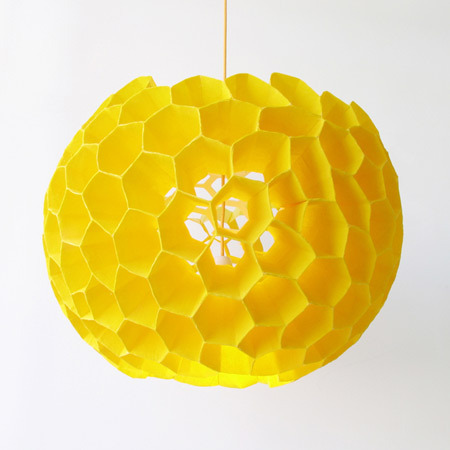 The coral lamps are formed by a multiplication of solidified felt hexagonal submodules. Through its amorphous geodetic round shape, the coral lamp and seating modules remind us of sea life coral structures. In the age of collage-living scenarios the coral modules are a transparent and open kind of geodetic structure with a strong sculptural appearance. Influenced by the shapes of microorganisms of marine life, the overall shape of the CORAL is created by a multiplication of submodules. The edition is created by studio aisslinger and launched in 2009. The CORAL is built in various shapes and formed by an addition of hexagonal funnels. The individual units are hybrids of felt and polycarbonate, allowing a comfortable and elastic self supporting structure. The A-chair is a tubular cantilever chair with a filigree appearance. In an architectural space the A-chair is hovering with a maximum of constructive transparency and lightness. The A-chair enhances virtually any environment. Its linear shape comes from the use of an endless loop of a 25 mm tube. The transparency of the seat and backrest is created by a grid of metal rods. The A-chair product family has the following versions: standard chair, bar-stool and a low easy chair.